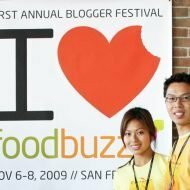 The two loaves of bread from Foodbuzz and Nature’s Pride was way more then the two of us can handle in one week so we decided to make something else besides the bread cups with shrimp and pork belly. The other idea we had was to make grilled cheese sandwiches. But of course we couldn’t just make regular grilled cheese sandwiches, but it did inspire us to come up with this recipe of halloumi cheese toast where the bread and cheese is grilled, not just melted in the middle of the toast. Halloumi cheese is cheese originated from Cyprus and is classically made from goat and sheep milk. It has a higher melting point then regular cheese making it for perfect grilling. The texture is similar to mozzarella but has a slight briny and salty taste. So we paired it with toasted Nature’s Pride 12 grain bread and a salsa of tomatoes, Persian cucumbers and mint. Prep the cucumbers, tomatoes, and mint (or you can even thinly slice the tomatoes and cucumbers without dicing). Make the vinaigrette of olive oil, vinegar, lemon and season with salt and pepper to taste. Combine with vegetables and set aside in fridge. Toast the bread in a small toaster oven and in the mean time, heat a nonstick pan on medium high without oil and fry the cheese until golden brown on each side, about 2 min per side. It may crack a bit when frying, so be gentle when flipping it over. Place on toast and top with salsa and serve immediately. 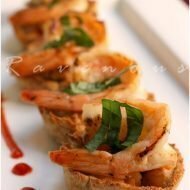 Only minutes to prepare, this is an quick and easy appetizer. The combination of cunchy toasty bread, hot fried cheese, and fresh salsa of tomatoes, cucumbers and mint make this one great bite! What a beautiful presentation! And the flavors sound great! These cheese toast is just sumptuous. Haloumi could be hard to find here but I'll try this with our local cheese. I'm just craving it now. Anh: You're right! it's hard to get that nice gold crust on tofu if it was pan fried…if only..
Divina: thanks! fryable cheeses are great so we'll forward to your post. Well well, this is absolutely great! A good combination of each ingredients to be a balanced diet. A delicious sandwich! 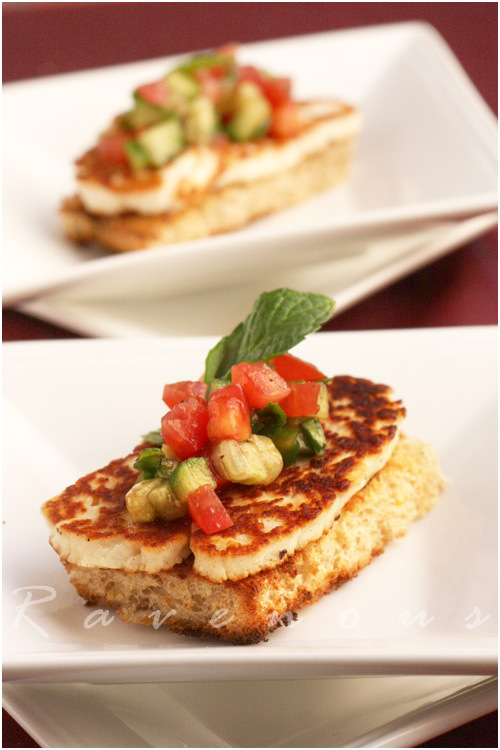 Fried Halloumi cheese sounds wonderful and I love the addition of mint in the salsa! 5 Star Foodie: The cheese is a bit briny so adding fresh flavors of cucumber, mint, and tomato is a nice contrast. I love halloumi cheese. Yum! This is breakfast I want to wake to in the morning 😉 beautiful colours. i love cheese, any kind of cheese! just hv never put cheese on toast though. if grilled cheese sandwich counts. Noobcook: We like this as a snack anytime! Mmmmm I have been wanting to try Haloumi cheese for awhile now! I keep seeing it everywhere! I love all kinds of cheese, but this looks amazing. Nicely done. 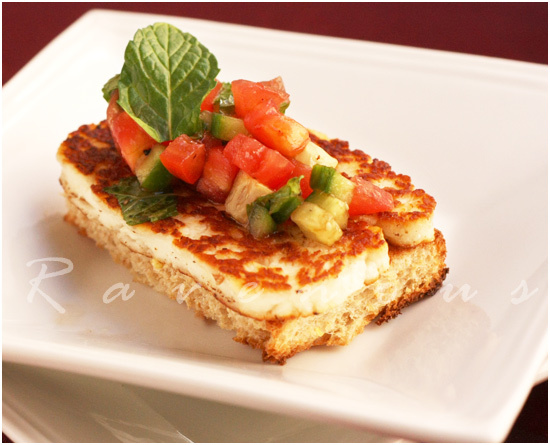 rose: Halloumi is a great cheese to grill/fry, try it! Oh my goodness! My mouth is watering! This looks and sounds delicious! Esi: We agree–the lemon and briny flavors work really well together! Oh wow! Congrats on winning the sponsorship! Both of your posts were so good I really thought you deserved to win. Can't wait to meet you at the conference! Heyy…congratulations on being one of Nature Pride's Ambassadors. Truly deserved. This cheese toast looks so tempting so do those shrimp cups. jen: We actually found this out through you!! The email they sent went to our spam! Thank you and looking forward to meeting you! your pictures are beautiful! Can't wait to meet you both!! So excited we won!! This dish looks delicious! I can't wait you meet you all. stephchows and Brittany:Thank you! can't wait to see you all there! Cheese is the favorite of most of people and it can be added in any dish to make it more tasty. I love cheese Garlic bread but never heard about Fried Halloumi Cheese Toast but it is looking very tasty dish. I clicked your “Pin it” button to add to my Mouthworthy Lust board but the images for this post are not pinable. Help?